I have been posting mostly math-based Scratch projects so this is the first of several science-based Scratch projects that I will be posting in the near future. You may well think the simple movement strategy of moving forward until an object is struck, backing up a short distance, turning left or right through a small angle, and then moving forward again, is too simple to be of much use. But in nature, exactly this behavior can be found in simple organisms like the single-celled paramecium. 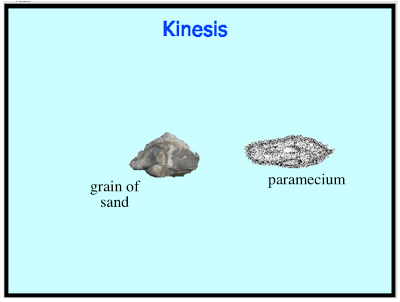 This mode of motion is called kinesis kinesis (a movement that is a response to a stimulus but is not oriented with respect to the source of stimulation). Small hairs called cilia cover the outer body of a paramecium. These hairs act like tiny oars to propel the organism through water and also help the organism gather food. When a paramecium strikes an object in its environment, the cilia reverse direction moving the paramecium backwards. The organism then turns left or right through a small angle, and moves forward. By continually repeating this process the paramecium is able to move around obstacles in it path. In this Scratch simulation, the paramecium is swimming though a thin layer of water containing a grain of sand. The sprite 1 script models kinesis. I have on my ‘to do’ list to model a euglena that propels itself with a single, long cilia and an amoeba that 'flows' pseudopodia (false feet) to move. You can view, run, and download this project by clicking on this link.